Getting on top of your finances is not a “one and done” kind of thing. You can’t make a budget on January 1st, never look at it again for the rest of the year, and expect to see fabulous improvement in your finances. The more you are actively engaged in what is going on with your money, the more you will see progress toward your financial goals! For us, this means using a series of daily, weekly, and monthly good money habits so that we stick to the budget and reach our goals. So let’s get into what this looks like throughout each month! I started doing this last year when we were trying to pay off debt and it has made a massive difference in how well we stick to our budget. I found that if I don’t record our spending right away, I get overwhelmed and don’t do it at all. This leads to us not knowing where we’re at with our budget. Do we still have eating out money left or are we $50 over budget? Knowing where we’re at with our budget in real time helps us stick to the budget. It’s that simple. Every single day, if we’ve spent money, I record it in my tracker. Right now I am using an app called iSaveMoney to track our spending. For years, I used my Budget and Spending Tracker Spreadsheet, which you can download for free below! I still use this spreadsheet to create our budget each month, I just have found it easier to track our spending on the app. If you aren’t sure where to start with getting in control of your finances, I’d recommend you start with recording your spending daily. Knowing where all of your money is going the best first step. It may seem overwhelming to start with something you need to do every day, but I’ve actually found that sometimes it’s easier to do something every day than once in a while. You could set a daily alarm on your phone for 9pm each night as a reminder to record any spending that happened throughout the day. The #1 thing I do that saves us money on groceries is meal planning. No lies. I create our meal plan and grocery list every week. We do not shop without these lists and we do not buy something if it is not on the grocery list. I try to check in with all of our accounts once a week: banks accounts and our credit card account. Being aware of what’s going on with your money is a great way to get in control of it. Just recently I checked our credit card account and realized that we had been charged because a free trial had ended. I immediately canceled the subscription so that we wouldn’t get charged again. If I hadn’t been vigilant about checking our accounts, we could have been paying for that subscription for months without know it. Checking our accounts also helps me know if Austin spent money and forgot to tell me about it. This way, I can record the spending right away and keep our budget current. This means that I transfer any money spent from our sinking funds into our checking account so that I can pay off the credit card. I also transfer money from savings to checking for the next month (all of the money we earn in April gets put into a savings account to pay for everything in May). I create and print our budget spreadsheet for the next month and make sure all our money is in the right accounts for what we need. After I “do the budget”, I know how much money we have to put toward our current goals. It may take a few days for the money to get transferred to the proper accounts, but when it’s in place, I color in our thermometer! It’s an exciting way to mark our progress! I wrote an entire post about why you need to track your financial goals in a visual way and some fun ways to do it. This is an easy one because it’s automatic! Sidenote: We also have mini retirement savings that happens throughout the month with Acorns. Every time we spend money, Acorns rounds it up to the nearest dollar and deposits it into a retirement account for us. It’s a nice, painless way to save extra! Take a look at Acorns here. Lastly, money gets automatically taken from our checking account at the beginning of each month and placed into our sinking fund accounts. Our sinking funds help us to keep our budget pretty much the same from month to month. We don’t have to budget more in December for Christmas because we have been saving money in the Christmas sinking fund all year long. Our budget looks the same in December as is does in June, but we have the money we need. 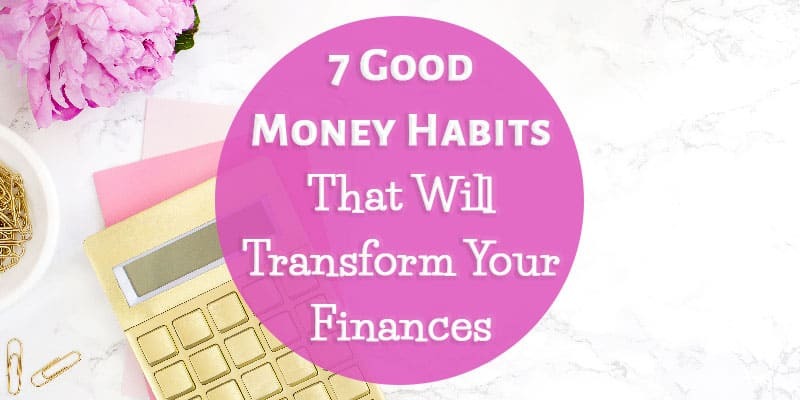 Can you see how these habits improve our financial situation in huge ways? The best way to reach your financial goals and to avoid money stress is to be fully aware of what’s happening with your money! 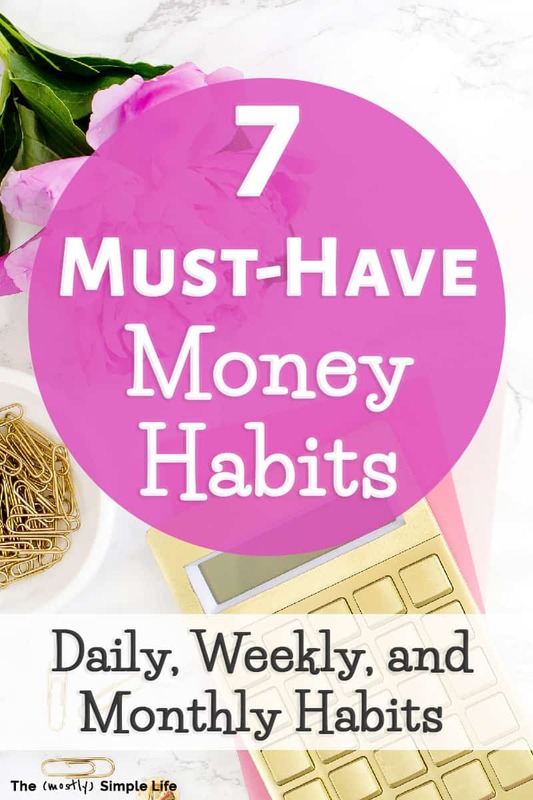 Which of these money habits do you think would be most helpful for you to work on? Choose one and get started! I’ve never tried the thermometer method but I think I should. It would be more like for a savings goal than paying off anything. Getting your finances under control when you’re behind is definitely tough, but not impossible! Everyone starts somewhere. Like I said in the post, I think recording your spending daily is a great place to start. Once you can see where your money is going, you can work on spending less, getting on a budget, and getting to a better place with your money. You can do it! I just got your meal plan guide. So simple so good. I am laminating it so I can reuse it each week. Wonderful! I LOVE the idea of laminating it!